Help Advance Environmental Justice in Seattle! The Office of Sustainability & Environment is hiring two positions that will be instrumental in advancing environmental justice in Seattle. Both positions close on March 26. The Equity & Environment Program Manager will bring strong management, policy, and stakeholder engagement skills to implement the City of Seattle’s Equity & Environment Initiative. The Equity & Environment Program Coordinator will serve as the OSE lead on outreach and engagement to stakeholders and residents, build community partnerships, support ongoing involvement of people of color, people with low incomes, immigrants and refugees, limited English proficiency individuals and Native peoples, manage grant distribution, and staff the Environmental Justice Committee. Fresh Bucks, a healthy food program focused on getting more fruits and vegetables into the homes of families with low incomes, closed out a year of record growth in 2018. The program helps Seattle residents afford fruits and vegetables by providing a dollar-for-dollar match of SNAP benefits (food stamps). Additionally, the City distributes Fresh Bucks vouchers that can be used without SNAP benefits to buy fresh fruits and vegetables at participating retailers. Boosted by Seattle’s Sweetened Beverage Tax, Fresh Bucks expanded the number of locations where Fresh Bucks is honored—including all Seattle Safeway stores. Fresh Bucks not only helps local families eat healthier but also supports our local economy. In 2018, customers leveraged their Fresh Bucks benefits to purchase over $1 million worth of fruits and vegetables from Seattle businesses and farmers markets, more than four times as much as the previous year. The Fresh Bucks program will continue to grow in 2019. Program enhancements—like an online application and an expanded partner network that will help with outreach and recruitment—are expected to drive participation in the program. Stay tuned for more details in the coming weeks! For more information on Fresh Bucks, including a complete list of all locations where Fresh Bucks can be used, visit www.freshbuckseattle.org. Fresh Bucks Fact Sheet – feel free to share! The City of Seattle, through the newly created Environmental Justice Fund, awarded $347,525 for nine community-based projects to improve environmental conditions and respond to impacts of climate change. Funding was awarded up to $40,000 for projects that will be led by and benefit those most affected by environmental and climate issues: communities of color, immigrants, refugees, and Native people—including people with low incomes, youth, and seniors. As one of the strategies advancing Seattle’s Equity & Environment Agenda, the Environmental Justice Fund was created with the understanding that the most effective environmental and climate solutions come from the community itself. The fund supports projects that honor the lived experiences of community members and that put them in positions of leadership to meaningfully participate in project design and implementation and to use their knowledge to influence the work. Project proposals were reviewed by a team of five community members, some of whom also serve on the City of Seattle’s Environmental Justice Committee. An intergenerational project that includes a 16-month curriculum engaging elders and youth, including monthly workshops about mindful eating and the therapeutic, positive effects of gardening. The elder component will include mental health and education about nutrition; the youth component will include an educational science program in addition to gardening. A youth leadership program that includes a youth-run dinner program that brings together 50-60 youth once a week to cook an improvised dinner using fresh vegetables and inspirations from family traditions, and to lead each other in a series of activities and conversations focused on culture and food justice. A program of climate- and environmentally-focused activities emerging out of their Yahowt Just Transition listening sessions. Activities will promote climate resiliency and will focus on permaculture, food sovereignty, just transition, and the arts. A partnership between Rainier Valley Corps and Got Green to address the lack of diversity in the environmental movement by developing a pipeline of emerging leaders of color with a racial equity and intersectional lens. The Green Pathways Fellowship Program will recruit fellows of color who will be placed in pairs to work full-time at environmental organizations. A culturally-responsive, student-directed learning experience for Somali youth that focuses on environmental health. Activities will include educational workshops about environmental health, opportunities to learn to advocate for environmental justice and community volunteerism that exposes children to concepts of environmental preservation. SPIARC staff and a cohort of promotoras will be trained on indoor air quality improvement best practices (mold prevention, non-toxic pest management, green cleaning) and work to inform and support residents of tenant rights and resources available to them in the City of Seattle. Activities will include development of effective environmentally-focused engagement tools and provision of healthy home kits to community members. Seattle Globalist will create an investigative journalism fellowship program to train journalists from communities of color and immigrant communities to uncover environmental justice issues in the community and raise awareness about these issues to promote change. Each fellow will develop and complete an investigative story based on ideas from communities of color and immigrant communities. Sustainable Seattle’s RiSE (Resilience, Sustainability and Equity) program is a formal coalition of neighborhood leadership driving change in the frontline Seattle communities most at risk for climate disaster. This program serves neighborhoods historically excluded from environmental initiatives, or for whom solutions are prescriptive and focus more on the natural environment than root causes or correlations between environmental and community health. This article is part of the series: “Seattle Environmental Justice in Action” — highlighting projects and organizations that are advancing environmental justice in our city. In 2017, the City of Seattle and the King Conservation District (KCD) to support projects that advance environmental justice along with improving natural resources in Seattle. Project proposals were required to address the goals of the Seattle Equity & Environment Agenda as well as natural resource priorities. The Rainier Beach Community Farm Stand is a weekly event for the Ethiopian Community in Seattle (ECS). Every Saturday from 10 am to 2 pm, Liya Rubio, Rainier Beach Action Coalition (RBAC) Farm Stand Manager, and her team of staff and volunteers from RBAC and Roots of All Roads, set up a farm stand in the parking lot of ECS. The stand brings in locally sourced fresh produce from people of color (POC)-owned and operated farms to the Rainier Beach community. This is environmental justice in action. Michael, one of the Farm Stand Fellows, said he enjoyed working with the Farm Stand, especially learning how to handle cash, running a small business, and having the opportunity to go on field trips to explore other Seattle markets. Fellows are accompanied by three seniors recruited from ECS’ Senior Meal Program. The program is multi-generational, collaborative, and opens communication channels. The goal of the Farm Stand is to help local POC community members make healthier choices about their diet, especially those with lower incomes on EBT and SNAP. Liya and her team create this safe space at ECS each week so that community members can ask questions about healthy food and how to cook the fruits and vegetables found at the stand. As the weather starts to change in the next few months, the Farm Stand will transition into the ECS indoor space. The project is funded until February and will continue to bring healthy food and education to the Rainier Beach community through seed exchanges, cooking classes, and recipe sharing. 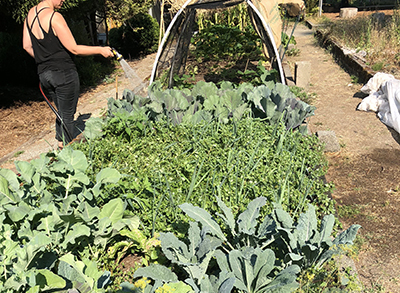 The Na’ah Illahee Fund’s Native Food Systems Initiative encompasses the planting, growing, harvesting, preparing and delivery of a mix of cultivated vegetables and native plants to urban Native people in need across Seattle. This is environmental justice in action. The program connects urban Native peoples across the Seattle area through a cohort model that builds community and shares knowledge. The current cohort consists of around 10-15 urban Native peoples from many Indigenous cultures, tribes, and lands. Most often, they are displaced indigenous peoples. In addition to not having access to their homelands, many urban Native people don’t have a garden space where they can plant something and return later to see it thriving. The garden and greenhouse at the Arboretum provides this garden space. Stephanie Reidl (Sts’ailes & Musqueam, First Nations) Indigenous Food Program Coordinator at Na’ah Illahee Fund has built the program from the ground up, including supplementing her own knowledge through permaculture training and recruiting cohort members. Many of the systems and principles Euro-Western people know as “permaculture” are appropriated knowledge of Indigenous peoples. The foods that the cohort members are growing and harvesting reflect a diverse group and diverse food traditions. The focus is cultivating heirloom seeds that can be regrown, re-harvested and redistributed to the community. These include Oaxacan green dent corn cultivated by Oaxacan peoples, 800-year-old squash and many others. Stephanie’s hope is that by providing this garden space, cohort members will share their knowledge, grow together and re-create community. This initiative is part of a thriving food sovereignty movement led by Indigenous peoples that incorporates seed sharing and organized shared learning programs to expand interpersonal networks around plant education and traditional knowledge. In coming months, Stephanie’s goal is to cultivate more opportunities for cohort members to lead the program with more learning activities and field trips. Concord International Elementary School is located in Seattle’s South Park neighborhood. Three hundred and sixty-five K-5 students attend the school: 60% of the students are Spanish speakers and 75% are part of the free and reduced lunch program. The 98108 zip code has disproportionally poor air quality and higher rates of childhood asthma than other parts of Seattle. “This neighborhood has lacked investment for many years. It’s really meaningful to have more beautiful space. Having beautiful surroundings is helpful to instill pride in our kids and show them that they are worth investing in because they are,” said Robin Schwartz, President of Concord PTA. To ensure community ownership of the of the project, Angélica Mendoza, parent of a child at Concord serving in the role of Project Coordinator and Community Outreach lead, conducted 9 months of engagement and surveying in both Spanish and English on social media and at community and school events, PTA meetings and neighborhood community centers. The final designs include a pollinator garden, funded by King Conservation District, and an updated front entryway, funded by the Duwamish Opportunity Fund and other foundations. The pollinator pathway is an S-shaped garden with native plants that will attract bees, butterflies, and hummingbirds. Beyond the obvious benefits of beautification and cleaning the air, children, many of whom live in apartments without garden spaces, will be able to learn about the flora and fauna through science classes and other outdoor learning opportunities. The project is the culmination of significant community outreach efforts and years of community-led work. The original idea for greening Concord came from the South Park Green Space Vision process in 2014 where the local community identified their ideal updates to public spaces. This article is the first in a series: “Seattle Environmental Justice in Action” — highlighting projects and organizations that are advancing environmental justice in our city. Created in 2017 as part of the Equity & Environment Initiative, the Environmental Justice Committee (EJC) supports City staff in creating and advancing environmental programs with strong ownership and collaboration from communities of color and connections to community-based solutions. An early priority for the EJC has been to support and cultivate projects and partnerships that demonstrate environmental justice in Seattle. Last year, the EJC forged a partnership with the Ethiopian Community in Seattle (ECS) to develop a pilot project that achieved the goals of building partnerships between local government and communities of color and leveraging existing cultural hubs to support place keeping and maximize environmental benefits. Public spaces represent an important bridge between the physical and symbolic capacity for critical civic engagement. Today, these spaces continue to be where communities of color can gather to exercise their civil rights through meetings, rallies, teach-ins, demonstrations, and celebrations of religious and cultural festivals with (minimal) fear of being targeted by law enforcement or explicit acts of racism. The EJC created and adopted the Principles of Public Space for Communities of Color to guide the process of the project. Over the course of the pilot project, the partners worked together to co-create an outdoor gathering space for community that also connects to environmental investments in the neighborhood. The collaborative design process with ECS ensured that the voices of their members and residents were centered throughout the development. The process created space for ECS staff to gain insight into city design and environmental solutions while increasing the capacity of government to listen to community and build environmental solutions that center the local users. The pilot project redesigned a 20 x 21-foot space for an outdoor style “parklet.” The Ethiopian Community of Seattle staff led and leaned into a collaborative design process with the City of Seattle, Framework, and the University of Washington. The focus from the outset was to enhance multigenerational gathering while supporting culture, growing food, showcasing plants that are native to Ethiopia or similar in type/look to Ethiopian plants, and including outdoor “classroom” elements to share about Seattle’s environmental programs and protections and East African heritage. The project was also an opportunity for the City to invest in providing an outdoor “cooling” spot in an area that is exposed to heat events and supports climate preparedness in communities by increasing social cohesion. During the process of creating the pilot project, ECS was able to participate in other built environment projects both on their own site and in their neighborhood. In the summer of 2018, ECS was selected as a recipient of the Equitable Development Initiative Capacity Building Grant for the community center to move forward on their plan to redevelop the property into senior affordable housing with a senior center and daycare on the ground floor. The EJ pilot project is a model for local government to support community lead design projects that provide quick wins while planning for longer-term projects. ECS was able to go through a quicker, tailored, and implementable design process. The ability to continue to run through a design process and then see it come to fruition, allows community members involved to have a deeper ownership of a space and the learned experience that will carry to future design projects. The collaborative design process of the EJ Pilot Project had an overarching goal of increasing environment investment but did so through a tailored community process that responded to a community priority. Today, the City of Seattle announced a new partnership with Safeway to make fresh fruits and vegetables more affordable for Seattle residents with limited incomes. Fresh Bucks at Safeway—a healthy food incentive program for SNAP/EBT (food stamps) recipients—launched today at all Safeway locations across the city. Seattle Safeway shoppers can now leverage their purchase of fruits and vegetables into additional healthy produce. “Some of our neighbors in Seattle have to choose between paying their rent, paying medical bills or buying groceries. Cost should not be a barrier to buying healthy food for our children and families. The Fresh Bucks program makes healthy food more affordable, and by partnering to expand these benefits, Seattle families will get the good produce they deserve,” said Seattle Mayor Jenny Durkan. Fresh Bucks at Safeway gives shoppers who buy at least $10 worth of fresh fruits and vegetables using their SNAP/EBT and Safeway Rewards card a Fresh Bucks coupon for $5 off their next purchase of produce. There is no limit as to how often shoppers can qualify for a Fresh Bucks coupon. Fresh Bucks at Safeway will be available at all Safeway stores in Seattle. Another aspect of the program is Fresh Bucks Rx. Qualified shoppers can receive Fresh Bucks as a “prescription” from participating health systems and organizations. These fruit and vegetable Fresh Bucks prescriptions can be redeemed at face value for fresh produce at all Seattle Safeway locations with no purchase necessary. The City of Seattle partnership with Safeway is funded through revenue from the City of Seattle Sweetened Beverage Tax (SBT). SBT revenue is used in part to make healthy food choices more accessible for low-income communities and expand food access programs like Fresh Bucks. Fresh Bucks first launched in 2012 and includes strategies to increase healthy food access for families with low-incomes and underserved communities, while also keeping food dollars circulating in our regional economy. Fresh Bucks is also available at farmers markets and neighborhood grocery stores. The Seattle Office of Sustainability & Environment (OSE) administers the Fresh Bucks program in Seattle. To learn more about Fresh Bucks, visit www.freshbuckseattle.org. Deadline for proposals is October 15. In partnership with the Seattle Foundation, the Office of Sustainability & Environment is excited to announce the Environmental Justice Fund, a new grant opportunity for community-led projects that improve environmental conditions and respond to impacts of climate change. The Environmental Justice Fund was co-created by the Environmental Justice Committee—12 people with deep community roots who work closely with communities on environmental justice issues—with support from the Seattle Office of Sustainability & Environment. The Environmental Justice Fund recognizes that the most effective environmental and climate solutions come from the community itself and that community members are in the best position to design and carry out projects that include community, culture, nature, family, health, food and/or education. Communities of color and people of color-led organizations are invited to submit proposals for projects. Projects should be led by and benefit the people most affected by environmental inequities: communities of color, immigrants, refugees and Native people—including people with low incomes, youth, and seniors—who live, learn, work, worship and play in the City of Seattle. There is $250,000 in funding available from the City of Seattle, with grants administered by the Seattle Foundation. The maximum grant award will be $40,000. Projects may begin as soon as January 2019 and must be completed by June 2020. Proposals are due by 4:00 pm on Monday, October 15, 2018. Clients at Casa Latina recently had front row seats to a live cooking class as they learned about healthy, affordable meals on a budget. And now, buying fruits and vegetables to make healthy meals for their families just got easier thanks to a partnership between Casa Latina and the Fresh Bucks program. The Fresh Bucks program is working with Casa Latina to provide Fresh Bucks vouchers for Casa Latina clients to buy high-quality, local produce from any of the 33 farmers markets or six neighborhood grocery stores participating in the Fresh Bucks program in Seattle and King County. This year, Fresh Bucks is serving more shoppers by expanding the program from EBT/SNAP (food stamp) recipients to also providing the benefit to families who may not meet the federal requirements for food assistance programs, but still face hardships when it comes covering their food expenses. This expansion is made possible through funding from the City of Seattle Sweetened Beverage Tax. Shoppers can use Fresh Bucks at 33 farmers markets in Seattle and King County, as well as six, ethnic grocery stores open year-round. To find participating locations or to find out more about the Fresh Bucks program, visit the Fresh Bucks website.